The best thing I ever ate was a crepe off of a food truck in Paris. Perhaps it was because I consumed it at the fourth meal hour of 3:00 a.m., but I still dream of the soft yet slightly crunchy crepe oozing lots of gooey cheeses and fresh spinach. Once I started cooking Jewish cuisine for a living, I realized my beloved crepe was really just the French equivalent of Bubbe’s classic cheese blintzes. 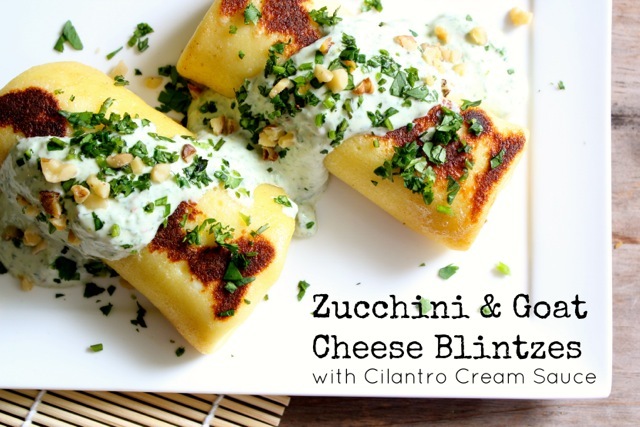 I took it up a notch with these Goat Cheese and Zucchini Blintzes with Cilantro Cream Sauce. With Shavuot around the corner, I have been knee deep in dairy recipes. You don’t even want to know how much cheese I have eaten this week! Blintzes are a classic dish served on Shavuot, when we eat dairy to commemorate when the Israelites received the Ten Commandments right after their Exodus from Egypt. 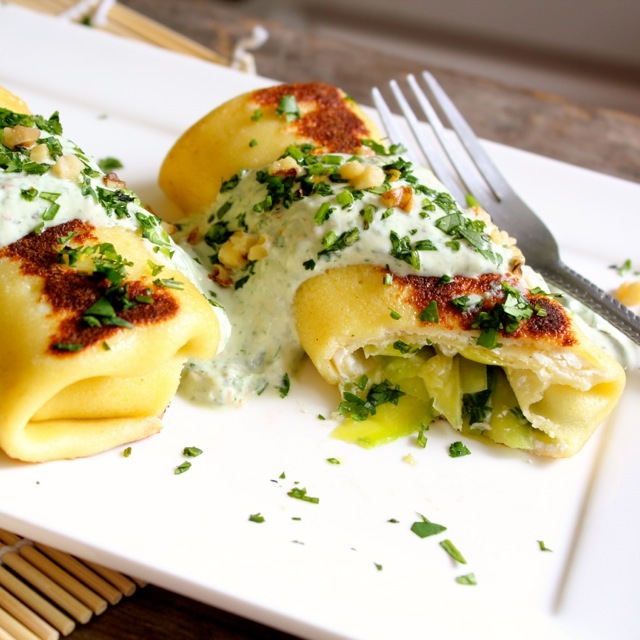 Inspired by the Israelites escape to the “land flowing with milk and honey” (Exodus 3:8), I stuffed these blintzes with lots of tart goat cheese, crunchy zucchini, and topped the whole thing with a creamy cilantro sauce. This isn’t just a holiday treat, but one you’ll want to eat all summer long. Crunchy, creamy, gooey goat cheese and zucchini blintzes! To make batter, combine the flour, sugar and salt. Then add the eggs, milk and olive oil and whisk until no lumps remain. Let your batter rest in the refrigerator at least 1 hour to let the gluten relax. While the batter is resting, make the filling. Heat extra virgin olive oil in a large sauté pan over medium and then add onions and a pinch of salt. Sauté just until soft, about 3-5 minutes. Then add in garlic and sauté for one more minute. Add in zucchini and continue to sauté for about 5 minutes until zucchini is cooked but still has a bite. Stir in Parmesan cheese, cilantro and lime juice until cheese melts. Set aside. To make cilantro cream sauce, combine all ingredients in a food processor until smooth. Add a little olive oil to sauce if you want a thinner consistency. Set aside. To make blintzes, butter a 9-inch nonstick pan with a thin coat of butter over medium high heat. Then pour ¼ cup of batter into the pan to coat the bottom. Swirl the pan to coat evenly. After about a minute you will see the ends begin to curl up- your blintz is done! Do not flip. Slide blintzes onto parchment paper to allow them to cool. Don’t layer blintzes together or they will stick! Spread a spoonful of goat cheese towards the bottom of each blintz, and then layer with a heaping Tablespoon of the zucchini filling and sprinkle with walnuts. Fold the bottom of the blintz up to cover the filling and then fold the sides in. Then roll like a little Jewish burrito! Add 1-tablespoon butter back to the medium nonstick pan over medium high heat and cook on each side until golden brown- or about 1-2 minutes per side. 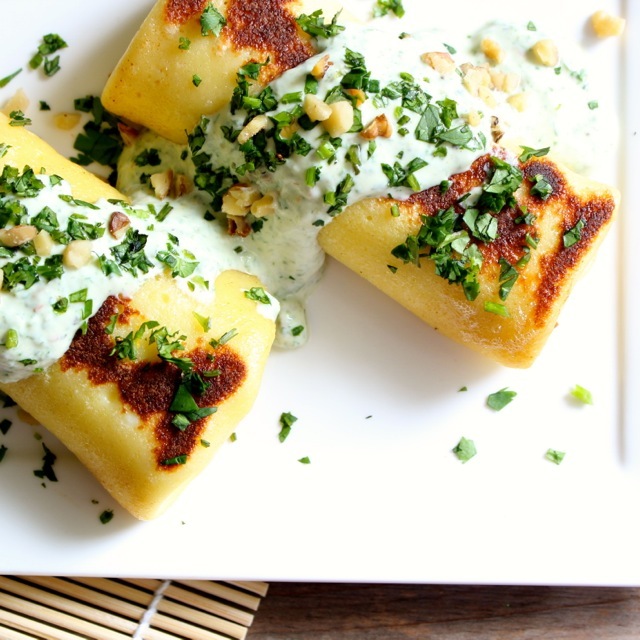 Drizzle cilantro cream sauce over blintzes, and sprinkle with more walnuts and cilantro for garnish. You will also need 1 hour for batter to rest.